Quantitative Aptitude section was the second most attempted section after the reasoning section in the recently over IBPS CLERK Prelims and RBI Assistant Prelims Exam 2017. Also many of the aspirants have been facing difficulties in attempting the questions from this particular section as the questions asked in this section varies for exam to exam and not constant. 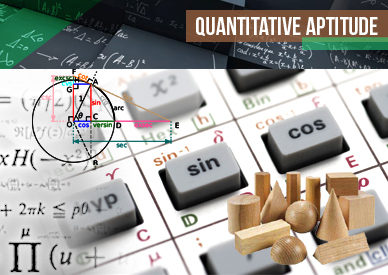 So we have decide to provide daily questions based on each topic available in the Quantitative Aptitude section and the aspirants can get benefited and get accustomed to the pattern of the questions in the quants section. The timing required to solve those questions should be less which the aspirants will gain in solving all these questions. Try these questions which are asked in the recent examinations and check your level of expertise in these topics and this could also be useful for your forthcoming exams too. Q.1) 35, 60, 110, 260, 860, ? Q.2) 2, 10, 29, 70, 144, ? Q.3) 11, 22, 66, 264, 1320, ? In each of these questions a number series is given. In each series only one number is wrong. Find out the wrong number. Hence, √847 is the wrong number. Hence, 7508 is the wrong number. Hence, 728 is the wrong number. Hence, 39 is the wrong number. Hence, 863 is the wrong number. You can check the other Important Reasoning Topics below here.